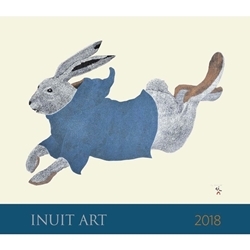 The 2018 Cape Dorset Inuit Art Calendar celebrates the work of twelve outstanding Inuit print artists from Cape Dorset, including Pitaloosie Saila and the late great artists Kenojuak Ashevak, Napachie Pootoogook and Tim Pitsiulak. An insured shipping charge is added to the price below. Canadian buyers are charged GST (5%). The calendar measures 12 inches high x 14 inches wide.